A popular romance, The Hypnerotomachia Poliphili, (Poliphilo's Strife of Love in a Dream), published in 1499 in Venice by the monk Francesco Colonna, also had an important influence on the gardens of the Renaissance. It described the voyage and adventures of a traveller, Poliphile, through fantastic landscapes, looking for his love, Polia. The scenes described in the book and the accompanying woodcut illustrations influenced many Renaissance gardens; they included a lake-island (as at the Boboli Gardens), giants emerging from the earth (as at Villa di Pratolino), the labyrinth, and the fountain of Venus (as at Villa di Castello) where Poliphile and Polia were reconciled. While the early Italian Renaissance gardens were designed for contemplation and pleasure with tunnels of greenery, trees for shade, an enclosed giardino segreto (secret garden) and fields for games and amusements, the Medici, the ruling dynasty of Florence, used gardens to demonstrate their own power and magnificence. "During the first half of the sixteenth century, magnificence came to be perceived as a princely virtue, and all over the Italian peninsula architects, sculptors, painters, poets, historians and humanist scholars were commissioned to concoct a magnificent image for their powerful patrons." The central fountain at Villa di Castello featured a statue of Hercules defeating Antaeus, alluding to the triumph of the garden's builder, Cosimo de' Medici. over a faction of Florentine nobles who had tried to overthrow him. The garden was a form of political theater, presenting the power, wisdom, order, beauty and glory that the Medici had brought to Florence. Sacro Bosco. Sacred wood. A grove of trees inspired by the groves where pagans would worship. In Renaissance and especially mannerist gardens, this section was filled with allegorical statues of animals, giants and fantastic creatures. The oldest existing Italian Renaissance garden is at the Villa Medici in Fiesole, north of Florence. It was created sometime between 1455 and 1461 by Giovanni de' Medici (1421–1463) the son of Cosimo de' Medici, the founder of the Medici dynasty. Unlike other Medici family villas that were located on flat farmland, this villa was located on a rocky hillside with a view over Florence. In 1504, Pope Julius II commissioned the architect Donato Bramante to recreate a classical Roman pleasure garden in the space between the old papal Vatican palace in Rome and the nearby Villa Belvedere. His model was the ancient sanctuary of Fortuna Primigenia at Palestrina or ancient Praeneste, and he used the classical ideals of proportion, symmetry and perspective in his design. He created a central axis to link the two buildings, and a series of terraces connected by double ramps, modelled after those at Palestrina. The terraces were divided into squares and rectangles by paths and flowerbeds, and served as an outdoor setting for Pope Julius's extraordinary collection of classical sculpture, which included the famous Laocoön and the Apollo Belvedere. The heart of the garden was a courtyard surrounded by a three-tiered loggia, which served as a theater for entertainments. A central exedra formed the dramatic conclusion of the long perspective up the courtyard, ramps and terraces. Unfortunately, the construction of the Vatican Library in the late 16th century across the centre of the cortile means that Bramante's design is now obscured but his ideas of proportion, symmetry and dramatic perspectives were used in many of the great gardens of the Italian Renaissance. The Villa Madama, situated on the slopes of Monte Mario and overlooking Rome, was begun by Pope Leo X and continued by Cardinal Giulio de' Medici (1478–1534). 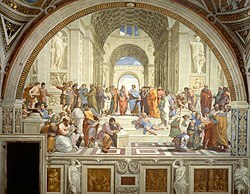 In 1516 Leo X gave the commission to Raphael who was at that time the most famous artist in Rome. Using the ancient text of De Architectura by Vitruvius and the writings of Pliny the Younger, Raphael imagined his own version of an ideal classical villa and garden. His villa had a great circular courtyard, and was divided into a winter apartment and a summer apartment. Passages led from the courtyard to the great loggia from which views could be gained of the garden and Rome. A round tower on the east side was intended as garden room in winter, warmed by the sun coming through glazed windows. The villa overlooked three terraces, one a square, one a circle, and one an oval. The top terrace was to be planted in chestnut trees and firs while the lower terrace was intended for plant beds. Work on the Villa Madama stopped in 1520, after the death of Raphael, but was then continued by other artists until 1534. They finished one-half of the villa including half of the circular courtyard, and the northwest loggia that was decorated with grotesque frescoes by Giulio Romano and stucco by Giovanni da Udine. Fine surviving features include a fountain of the head of an elephant by Giovanni da Udine and two gigantic stucco figures by Baccio Bandinelli at the entrance of the giardino segreto, the secret garden. The villa is now a state guest house for the Government of Italy. Garden of Villa d'Este. Fish ponds. The lower garden had a large marble fountain that was meant to be seen against a backdrop of dark cypresses, with figures of Hercules and Antaeus. Just above this fountain, in the centre of the garden, was a labyrinth formed by cypress, laurel, myrtle, roses, and box hedges. Concealed in the middle of the labyrinth was another fountain, with a statue of Venus. Around this fountain, Cosimo had bronze pipes installed under the tiles for giochi d'acqua ("water tricks"), which were concealed conduits which could be turned on with a key to drench unsuspecting guests. Another unusual feature was a tree house concealed in an ivy-covered oak tree, with a square dining room inside the tree. The Villa della Tore, built for Giulio della Torre (1480–1563), a law professor and humanist scholar in Verona, was a parody of the classical rules of Vitruvius; the peristyle of the building was in the perfectly harmonious Vitruvius style, but some of the stones were rough-cut and of different sizes and decorated with masks which sprayed water, which jarred the classical harmony. "The building was deformed: it seemed to be caught in a strange, amorphous condition, somewhere crude rustic simplicity and classical perfection." The fireplaces inside were in the forms of the mouths of gigantic masks. Outside, the garden was filled with disturbing architectural elements, including a grotto whose entrance represented the mouth of hell, with eyes that showed fires burning inside. 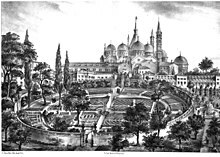 The Botanical Gardens of Padua (1543), from a contemporary engraving in the Basilica di Sant'Antonio. ^ Attlee, Helen. Italian Gardens – A Cultural History, 2006: 10. ^ a b c Cited in Attlee, 2006: 13. ^ Allain and Christiany, L'Art des jardins en Europe, Paris, 2006: 132. ^ a b Alberti, Leon Battista. Édifices destinés aux catégories particulières de citoyens, in L'art d'édifier, translated from the Latin by Pierre Caye and Françoise Choay, Book I, Paris, 2004: 429. ^ Allain and Christiany, 2006: 140. ^ a b Cited in Attlee, 2006: 21. ^ Allain and Christiany, 2006: 178. Wikimedia Commons has media related to Italian Renaissance gardens in Italy and Italian gardens (garden type).